LineChart control is your data visualization solution whenever it comes to analyzing long sequence of collected data, which can be represented as a chart in 2D space. For example if you measure a temperature of an industrial machine in regular intervals and you want to view the course of the temperature comfortably. For convenient orientation in your visualized data, LineChart provides different mouse functions. With scrolling mode, you can click inside the area of LineChart and drag the chart in the direction, you want. With zooming mode, you can select an area by dragging the cursor even outside the chart area. Then the whole LineChart starts scrolling and the zoom selection expands. 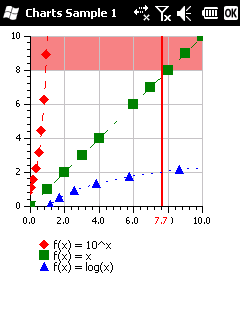 Zooming by a given factor for each axis is also supported. 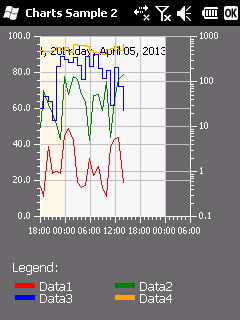 LineChart will expand or shrink the tick signs with labels and grid lines automatically and conveniently for you. Often you need to monitor values and make sure, these values are in certain range for safety operation. With LineChart, you can define regions with labels and certain background color. If you want to define just one bound value, you can do this also with the LimitLine feature, which allows you define a colored line at certain value. Regions and LimitLines works for both, x and y axis. 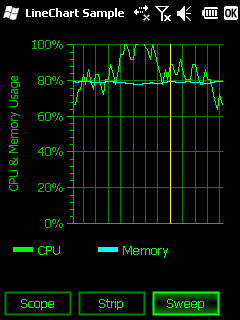 LineChart also contains TLegendPanel control, which is a panel, which you can place anywhere on your control. 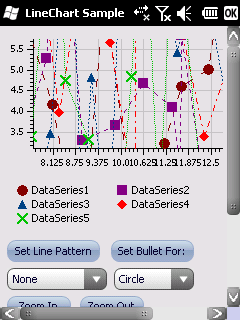 Then you attach it to LineChart and it will automatically display the bullets, color and name for each data series contained in the LineChart. You can choose from three different line interpolation modes for your data series. Straight connects the points with straight line, angled mode suits best values with step changes, with point mode you can visualize just the exact points in your collection of data. For differentiating the appearance of the lines you have also several options. You can choose bullet for the data points from 7 shapes. You can define different color for lines or even a line dash pattern. Do you collect data in real-time? You will then appreciate the animation feature which gives you an option to choose from sweep, strip or scope-like modes, which sets the line moving and chart scrolling to achieve the desired behavior. If you use any of these operating systems on your device and your device has a capacitive display, you can use multi-touch pinch gesture to zoom in or out in LineChart. LineChart is designed in such way, that you can execute the most of its methods/properties from different execution thread. Most importantly you can feed data to LineChart from a separate worker thread.